Political cartoon drawn by Paul Conrad on August 14, 1975. 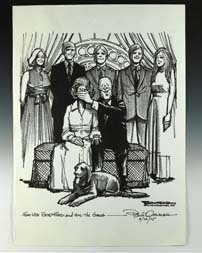 It depicts a drawing of the first family. President and Mrs. Ford are sitting down while the children stand behind. President Ford covers Betty's mouth with his hand. Text at the bottom reads, “For Mrs. Betty Ford and all the gang.” The cartoon refers to the First Lady’s opinionated and candid manner and how it affected the President’s poll numbers.